Looking forward to going out to Greece on your Beach Club Sailing holiday? One of the nice things about our Paliki Beach Club is its flexibility. We offer it on a bed and breakfast basis as there are so many incredible places you just have to visit and enjoy the local food. 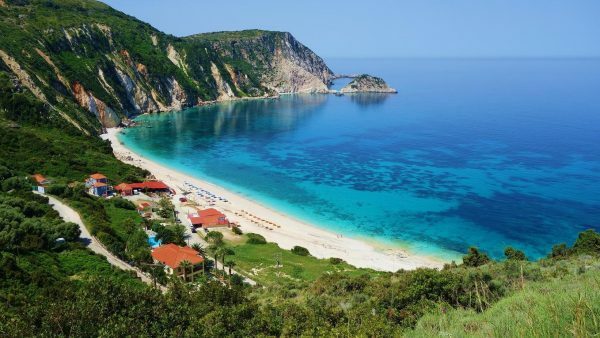 We just wanted to just to let you know a few of our favourite places/things to do in Lixouri, Kefalonia so you can enjoy during your next Sailing holiday in Kefalonia. We lived on the island for 15 years so know it pretty well, and consider the Paliki peninsula and Lixouri as our home. Here’s a few choices that you are sure to enjoy and are close to our Paliki Beach Club. Is a wonderful family-run Greek establishment – no frills but it has everything you need with a wonderful taverna that serves authentic Greek food from lunchtime to midnight. The food here is really, really good, fresh and very reasonable – it’s hard to beat. 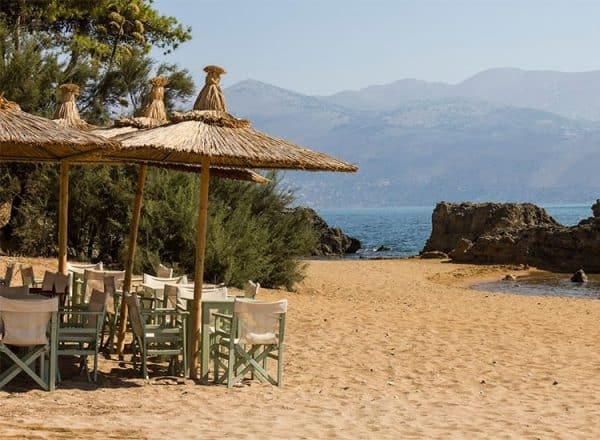 However, we do encourage you to visit just a couple of our favourite tavernas and beaches which are a short drive away and are located on great beaches. A 15-minute drive from your sailing holiday in Kefalonia base. This local gem never fails to impress. 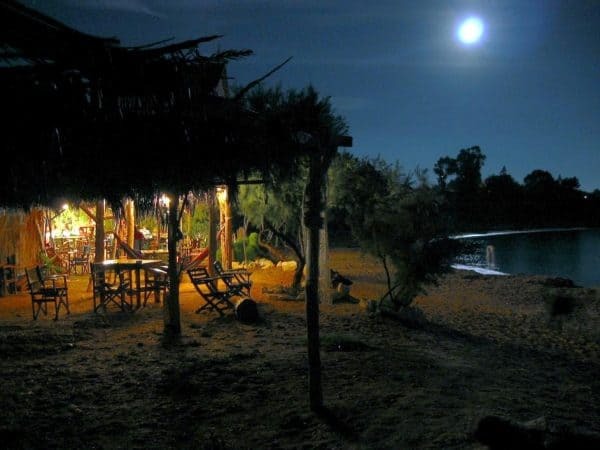 A rustic taverna on the beach, shaded by bamboo, you’ll sit with your feet in the sand looking out to sea. 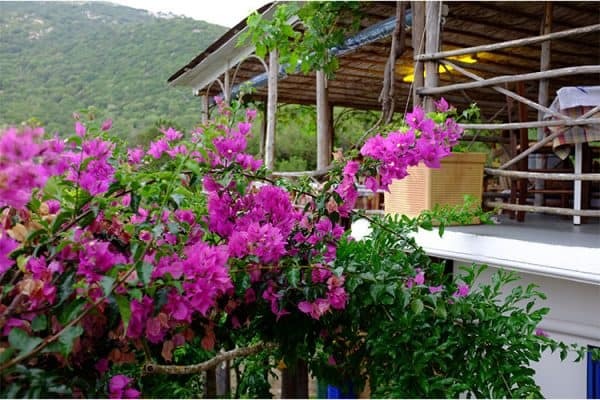 Exceptional locally caught fish and fresh vegetables and salad, organically grown in the owners own vegetable plots. If you go for fresh fish please do expect to pay a little bit more than elsewhere but the quality is excellent. This is a great spot to have lunch, relax, swim, snorkel, sunbathe, sleep and then start all over again by feasting well into the night. Do not miss it. A 15-minute drive from the club. Possibly the most dramatic view on the island, looking down from the cliff tops to the stunning beach and ridiculously blue sea below – this beach is our favourite for sure. We often come down for a late afternoon swim and then eat watching the sun set directly in front of us – it’s a great place for night swimming (skinny dipping anyone ). Choose the taverna you first come to called Erasmia. If you want fresh fish it may be worth asking the hotel to book you a table and request some fish is saved for you as they get very busy and sell out. The food here is fabulous and incredibly good value. There are always meat options on the menus for those of you not keen on fish (and of course chips for the kids). A 10-minute drive from the club. It’s very mellow here and yet another one of our favourite spots. You’ll be welcomed by Jimmy, your eccentric host and brilliant chef, who’ll put together mouthwatering dishes of sashimi to seared fillet steaks and char-grilled local sardines. Incredible views over the sea to Rabbit island and south towards Zakynthos. Great if the kids want to do Xi Beach (details below) and you want to hang at Sparos, as they can safely stroll along the beach only 10 mins away. We guarantee you won’t want to leave. If the youngsters want to have a bit of fun, then Xi Beach is definitely worth going to for a morning or afternoon. Water skiing, Wake boarding, Jet skiing and floating obstacle courses make this popular with older teenagers. Oh, there’s a low-key party atmosphere with DJ’s and lots of cool young Greeks hanging out drinking shots and enjoying the night scene. 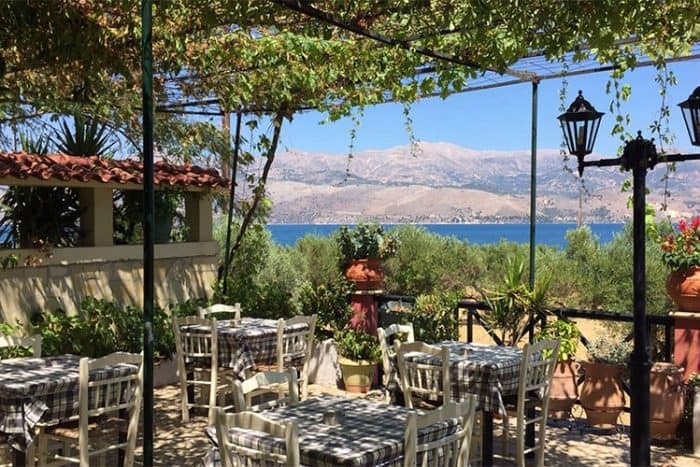 Only a short stroll from Paliki Beach club along the coast, this wonderful little taverna has a very limited menu – that’s its forte really, with around 8 delicious dishes always on the go. Try it all, order everything and enjoy with a locally brewed cold beer or chilled white wine on the beach. Atheras bay is about a 20 min drive from the beach club. Steeped in history and incredibly beautiful Atheras is a must see destination. 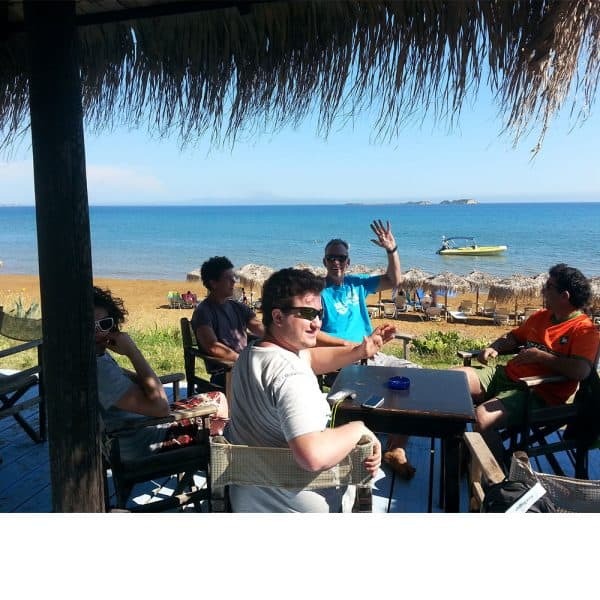 There are 2 excellent tavernas on the beach, both with excellent fresh fish and local meat dishes on the grill. Be sure to take your towel and swimmers, the water and swimming is divine. Only a 15 minute (flat) walk from the Paliki Beach Club. A vibrant little town that is non-touristy, very much Greek, and buzzing, especially in the evenings when everything revolves around the main cosmopolitan square. Just get a table at one of the cafes and you can spend hours watching the world go by. You simply must go to I-Scream which makes the best proper homemade ice creams we have ever eaten – you will find this on the square, a perfect treat for anyone on a sailing holiday in Kefalonia! Greek fast food – do you want to experience the most delicious fast food? The kids will absolutely love this. Greek Souvalaki Pitas filled with meat, a bit of salad and all for 3€. Ask the beach staff the best place to get these as they literally eat them every night – they can’t get enough of them. Ouzeria – This is traditional Greek Mezze style eating at its best, and you really should give it a try along with a glass of the delicious Lixouri Haritatos Wine. 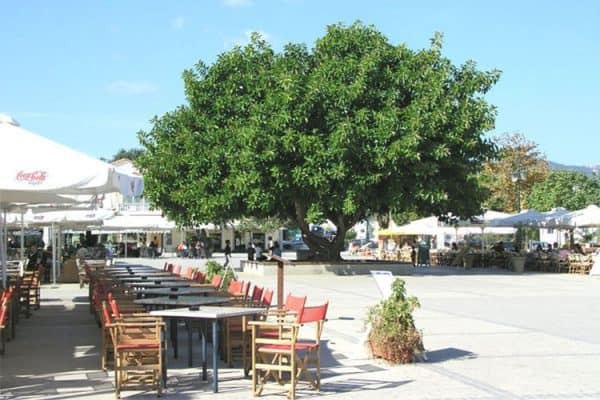 The Ouzeria is along the seafront road 2nd taverna along from the square. Winery – you may not have time, but if you can try and arrange to go to the Haritatos Winery. One of the islands oldest aristocratic families run this winery from the grounds of their beautiful ancestral home. The very hospitable and slightly eccentric brothers Kosta and Haritos will guide you around their winery and home.